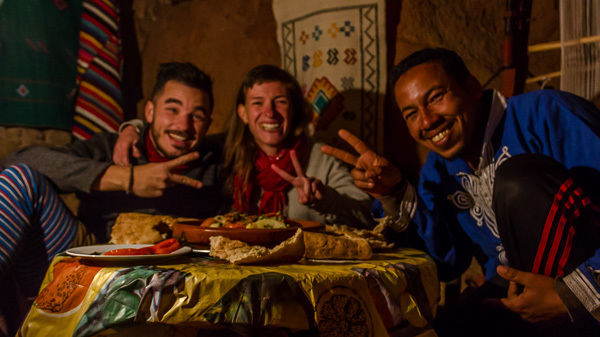 How We Stayed The Night In Ait Ben Haddou! After almost a week in Marrakesh, we finally emptied our lockers, checked under the bed and left to explore the High Atlas Mountains and our first stop was Ait Ben Haddou. 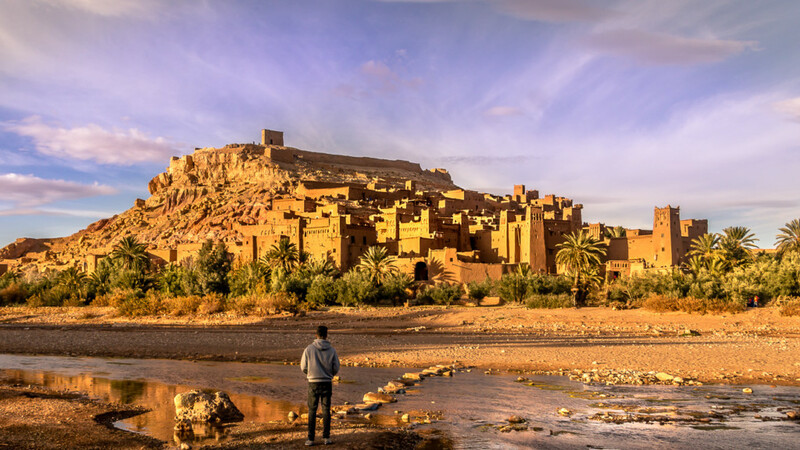 You’ve probably never heard that name before but chances are you’ve seen it in Game of Thrones or Gladiator as this 11th-century kasbah or fortified city is a popular filming location and we got to sleep inside for next to nothing! From afar the sight of the ancient walls majestically rising in front of you is simply breathtaking. Once inside, getting lost in the maze of winding alleyways is easy and you are just as likely to end up in a donkey’s stable as in the living room of one of the few families still living there. When you finally make your way to the top of the hill and see the sun go down over the palm-tree-strewn valley beneath you, it’s one of those moments where you remember why you decided to live out of a rucksack. For us, visiting the kasbah also meant having the first of many teas or “Berber whiskies” with locals. Somewhere between the entrance and the top we made a wrong turn and suddenly found ourselves standing slightly surprised on somebody’s roof. That somebody turned out to be Saïd, a very friendly man who is living with his wife Fatima and their two sons in a house that has been passed down in Saïd’s family for generations. When he showed us a little room on the roof with nothing but a few rugs, a candle, a picture of King Muhammad XI and two small windows with a stunning view of the kasbah and then casually added that he does actually rent it out we knew where we were going to spend the following night. 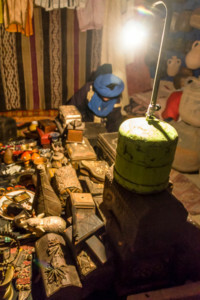 The next day, bags were left and welcome tea was had at Saïd’s place before heading out to explore the valley. Ait Ben Haddou is in fact only one stop on the so-called route of a thousand kasbahs so the area is pretty much a buffet of clay cities in different states of decay. Inside the crumbling walls of the one we found just down the river we were met by curious children, wood-carrying donkeys and women hanging out washing to dry, all untouched by the tourist circus nearby. As we were walking back to Saïd’s place in the afternoon, the second Berber whisky of the day was offered to us, this time by Idris. Idris works in a souvenir shop at one of the entrances to the kasbah and although we got off to a bad start playing the classical hassle-the-tourist-game he managed to convince us to follow him to the back room to have some tea. 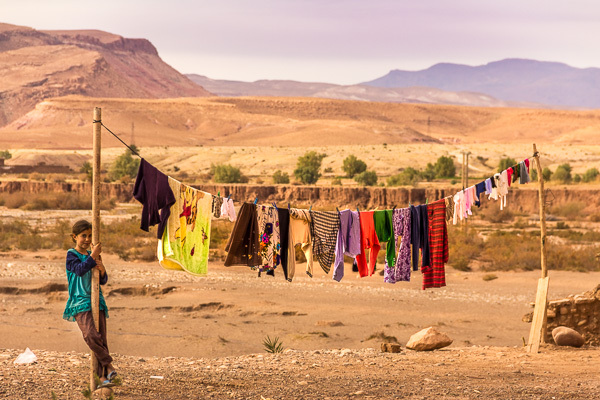 While digging up one piece of jewellery after another from a pile of treasure chests, Idris told us a little about the relationship between Arab and Berber culture. As it turns out, even though the majority of Moroccans have Berber origins, until the Arab Spring in 2011 only Arab was taught in schools and the usage of Berber language was actually censored. When we got back to the house, Fatima had left a delicious vegetable tagine simmering on the stove for us which we enjoyed by the light of a single gas lamp. Since she was spending the night in the village we instead had a very lovely dinner with Saïd during which he told us how the kasbah has changed from being bustling with life for centuries to only having a handful permanent residents today. Tired and with full bellies, we went to bed in our little room under the stars and, as you do when you’re staying in a UNESCO World Heritage site, watched Russell Crowe avenge his family and kill a bunch of gladiators. Finally, we put our culture hats away and jumped on a bus to the Todra Gorge to get some kilometres in those flip flops. 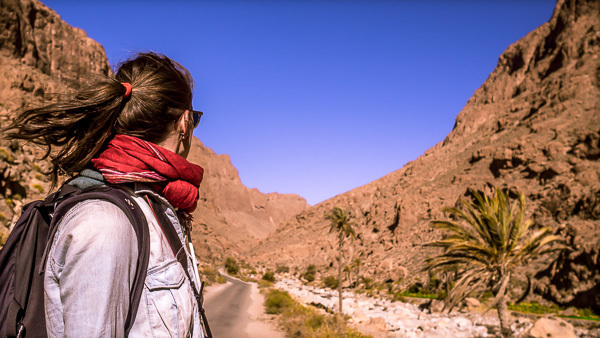 The area is a haven for both climbers and hikers as the impressive scenery made up by the narrow road squeezed in between two practically vertical mountain walls offers plenty of opportunities for outdoor activities. We opted for a revitalising walk along the small stream before having a mandarin break lying on the big rocks and enjoying the warmth of the sun. As the icing on the cake, we saw yet another beautiful sunset on our hotel’s absolutely amazing terrace surrounded by cherry blossom-like trees. After dinner, Hamoud, the owner of the hotel, poured us a couple of Berber whiskies and, as contradictory as it sounds, told us an interesting tea story. Supposedly, back in the day when a girl was meeting the man her parents had chosen as her future husband she would use the tea to communicate her verdict. If she put sugar in the tea it was a yes and if not, well, it was back to spouse hunting. Sounds great! 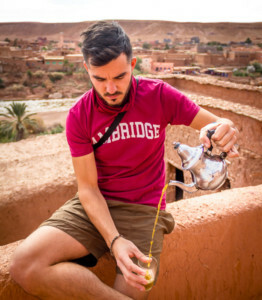 Me and my boyfriend are travelling to Ait Ben Haddou next week and I was wondering if you have any contact to your host from there and what was the room price? Thanks!